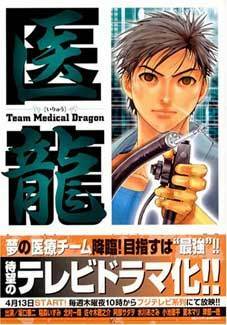 Team Medical Dragon is a relatively specialised medical manga drawn by Tarou Nagizaki and authored by the late Akira Nagai; a successful doctor and journalist. This series has been published periodically by the Shogakukan publishers and has been running since 2002. The story-line is primarily about the genius cardiothoracic surgeon Ryutaro Asada, who is hired by Dr. Katou; a tenacious female Assistant Professor at Meishin University Hospital. She calls upon Dr. Asada in order to perform the Batista procedure (a partial left ventriculectomy) for the thesis she is writing in order to achieve professorship. The ‘Batista team’ is then recruited throughout the story and the team-members’ individual development is described. The story-line then disseminates to describe various aspects of the Japanese Healthcare, such as the roles of a doctor, the sparse training opportunities for junior surgeons, cover-ups and framing of medical malpractice, the use of nurses as surgeons in times of emergency, the controversies of drug trials, drug abuse by healthcare professionals and corruption at the heart of the healthcare system. It is important to note that the Japanese Healthcare system in Team Medical Dragon is perceived as a ‘feudal society, run by incompetent Lords’ while the manga is a bid to expose the ‘illness of Japanese Medicine’. The frequent use of medical terminology, while comprehensible to healthcare professionals, might exclude some readers. Nevertheless there are other aspects of Team Medical Dragon to which non specialist readers will still relate. The drawings are full of surgical detail, with frequent use of symbolism. This manga is a prime example of the use of graphic novels as a political and social tool; it could also be perceived as alternative journalism. Despite its powerful description of corruption within Japanese healthcare, the controversies reported in Team Medical Dragon are perhaps too extreme to believe, and could have been included in order to promote the manga commercially. Team Medical Dragon overall, is a deeply medical manga that surveys many aspects of clinical practice and is a richly informative series. However, there are occasional brief scenes of a sexual nature and may not be suitable for those uncomfortable with such content. Despite my criticisms, it is a must read for healthcare professionals and patients alike.